This piloted Fi 103 is being jumped by a Gloster Meteor M.III from the RAF No. 616 (F) Squadron, 1944. The Reichenberg was a german attempt at creating a piloted version of the famous V-1 Buzz Bomb. 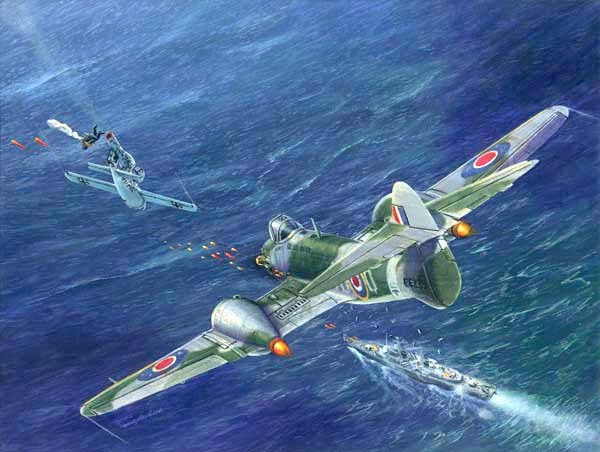 The intention was to aim the aircraft at a target, such as a ship, and bail out at the last moment. Never mind that bailing out might cause you to miss, and that the cockpit was right in front of the jet intake, or that if you did manage to escape the hurtling bomb you would be parachuting into the North Sea... It was considered to be very likely that this would be a one way trip for the pilot. There were actually several volunteers all ready to go, but the people in charge had second thoughts. Obviously, since the Reichenberg was never actually used in combat, this is an alternate history painting. Had they been used, it would have been very hard to stop them.